BotF is staying the Brassey Hotel in Barton, Canberra, which has a bar reminiscent of the bar in the Minder. It is the last place I’d expect to find a beer I hadn’t tried before. 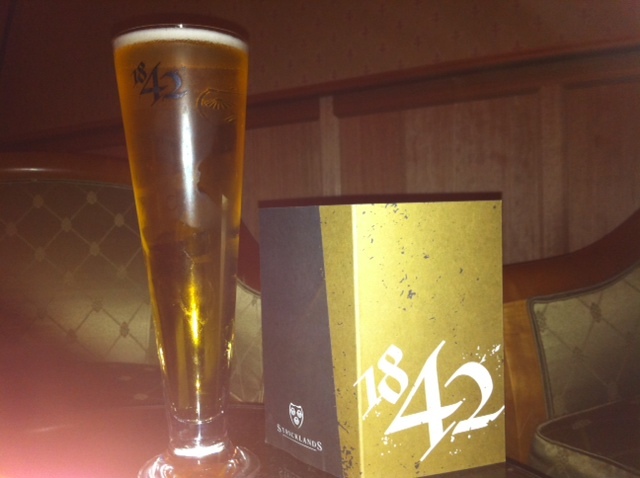 1842 is so far the single offering by the Strickland Beer Group, founded by 5 brothers who stumbled across a “very rare, very old-world recipe” for a for a Pilsner style beer. They claim to have created Canberra’s first “super-premium” beer. I reckon Canberra’s two other brewers who actually make their own beer, rather than outsource it, would argue differently. It’s not bad boys, but it isn’t “super premium” either. There is a sharpness that does linger pleasantly, but this is no stand out. Very amusing comment from the competiton … he he he!